KSFL Banbury’s Carlie Goode has struggled with M.E for many years now which has really affected her life and with no treatment available she had to find something to help! Carlie has had some amazing results with KSFL and wanted to share her story to inspire others. I’ve always believed that in life everything happens for a reason and that people are placed in our pathways at times through life when we need it most at the right time again for a reason. I was just scrolling down Facebook one day feeling really rubbish about myself and how I looked and where my life was at and happened to see something KSFL had posted. I decided to message Sindy to ask if she felt she could help me with nutrition and loosing weight given my circumstances that I could do zero excercise. Sindy said she could help me and came out to meet me in September 2014. I had spent many years yo yo dieting, and was the heaviest I had ever been at 12 stone 13 when i met Sindy. As soon as I met Sindy I clicked with her straight away I felt a huge sense of how much she wanted to help me and how much she genuinely cared about the situation I was in. I explained to Sindy that I was suffering from a very debilitating condition which meant that I could not do any of her classes, in fact I spent majority of my day in bed sleeping! The extent of physical activity for me was walking around my ground floor flat doing the minimal daily tasks with lengthy rests or sleep in between! So when I say I spent most of my time on my backside or laying down that was not a lie!! 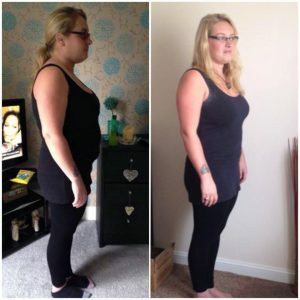 Sindy was still sure that not only could KSFL help me loose weight but also have positive impact on my health condition. So why was I spending my time on my backside you ask lol? Because in 2006 i was diagnosed with M.E also known as chronic fatigue syndrome! I had onset of symptoms many years before this but it was in 2006 after the birth of my daughter that it really hit and began to debilitate my life massively. What is it? That is a really tough one to explain, even the medical profession are a little flummoxed as to what causes it and therfore is no treatment for it either All iI can say is it is a set of symptoms that include fatigue, muscle pain, muscle weakness, headaches, blurred vision, foggy brain, lack of concentration just to name a few. Most people think of being tired all the time, there is a huge difference between being tired and having chronic fatigue, chronic fatigue is like having the flu, after having had a heavy night out on the drink, and having run ten miles, and physically mentally and emotionally not being able to move! Showering , washing your hair, washing up, the minimal tasks become something you have to fight to do and some days are impossible. I won’t go any further as I’ve found it truly impossible to describe to people over the years the feeling of this and how it impacts a persons life. But I will briefly just say my day went like this so you get a picture of just how inactive I was and this was on a better day some days I was in bed all day. So wake up get my daughter to school , come home, sleep til she finished school, get her dinner get her to bed then go back to bed myself! literllay on my backside all day lol! you get the picture!! Needless to say when I started my journey with KSFL I was not feeling good at all! I hated what I looked like was very depressed and felt like life was just passing me by and I was existing not living! I joined KSFL, unable to attend the meetings but have Sindy come to me once a week to weigh me and give me advice along with being a part of the online group! I am a very fussy eaty and to be honest I don’t like vegetables that much so at first I thought I am not going to be able to do this! I haven’t been “on it” religiously as no one is perfect and I think we all fall off the wagon from time to time , hey we are all human after all! But for me I found juicing to be a godsend! My favourite at the moment is carrot, apple, bannana and blueberry! yummy! But also I found I could have veggies to by adding them to the juice and not even tasting them with using apple as a base! What has kept me motivated is seeing the changes in my body, getting back into clothes I never dreamt I would be able to do! But also massively is Sindy’s attitude her support her guidance but also the group on Facebook, seeing everyone’s posts how everyone is doing how supportive everyone is of each other! Even if I do not post often I read everything and follow how people are doing and soon hope to start coming on a weds to meet the people of the group! So how do i feel now? I like myself now! I still would like to loose some more weight i haven’t reached my ultimate goal but I no longer look in the mirror and think I look vile! I can look in the mirror and feel proud of what I have achieved, and like the way I look. I am now 11 stone 2 and but have lost a lot of inches and am now back in size 12 jeans that I haven’t worn for 8 years! And to add I have done this with spending most of my time on my backside! lol Im not promoting for anyone not to do excercise if I could then I would , but what I am saying is that if I can do this then I believe every single person out there can, and if there are some days you don’t manage to excercise then don’t beat yourself up you can still achieve big results. My up most thanks to Sindy and every one who is a member of KSFL for the posts you all put up, dream, believe, achieve! If you are struggling with losing weight/ health issues KSFL can help you too!